most surfaces) and load up your gear quickly and easily. This feature works great not only for loading your product into the rack, but for real world use of your equipment as well. 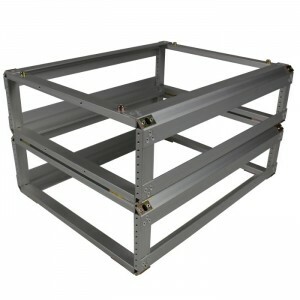 Once loaded, the frames slide into our shock mounted Excalibur Series of cases perfectly so you can transport your equipment to remote locations safely, then slide the racks out and stack them up on a small table for use – leaving the larger transport case outside so you don’t get too cramped while working. You can count on Ameripack to always offer the finest quality products at a reasonable price with the fastest lead times in the industry. We build the most innovative, strongest products on the market today.